Happy 13 days until Halloween! I felt like 13 days before the big day was the perfect time to post my first spooky treat... or trick. 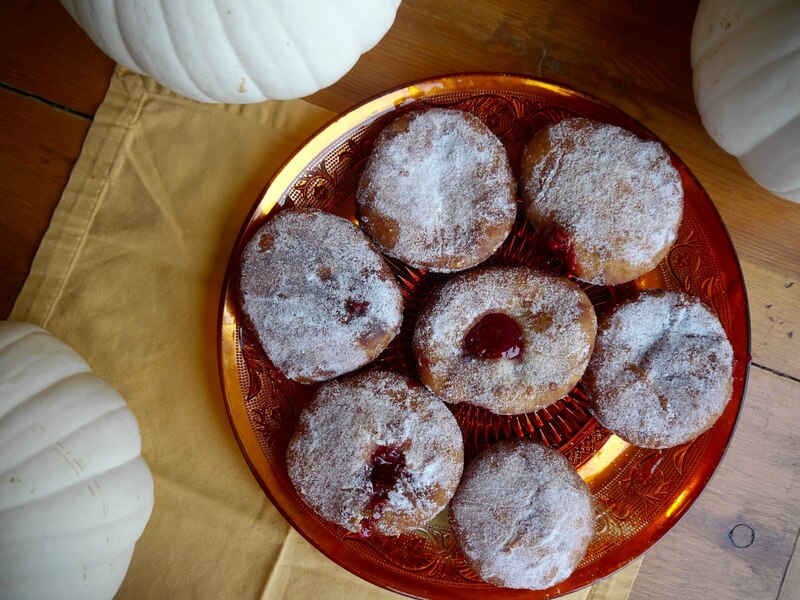 While these jelly-filled sugar-coated donuts look completely innocent, they're hiding an unexpected surprise... BEET JELLY! It might sound a little scary (I mean, it is Halloween), but trust me on this one. 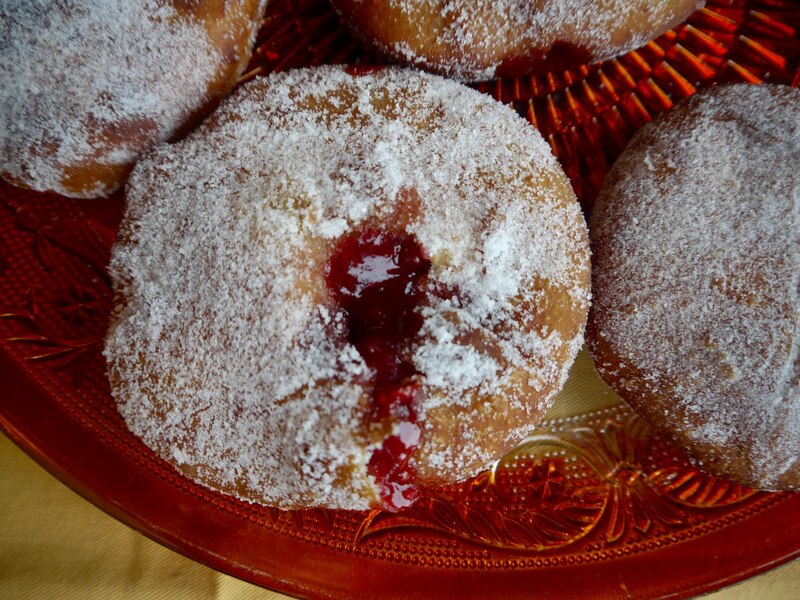 The beets add an earthy, subtly sweet bite to what would've been an overly-sweetened donut. I've always thought beet and chocolate harmonize nicely... plus the chocolate spider web on top adds the cutest Halloween decoration. I used dark chocolate, but I think white chocolate would mellow the intense flavors and not compete with the beet as much as a bolder dark chocolate does. I'm always partial to dark chocolate, though. The main reason I even chose to make a beet jelly in the first place was that it seemed like the perfect deep, rich red color to imitate blood as naturally as possible. This jelly, though, is my new favorite thing. Seriously, I couldn't stop licking the leftovers on the side of the pot. 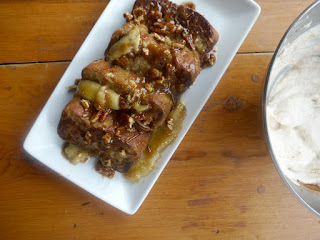 The best part about it is that it only requires a few simple ingredients and about 30 minutes of your time. It's addictive. I kind of want to make a PB&J out of it. Well, I totally would... if I had any leftover. I wish I could say I used it all on the donuts or that it was just so irresistible it only lasted in my house for less than 24 hours, but, unfortunately, that was not the case. 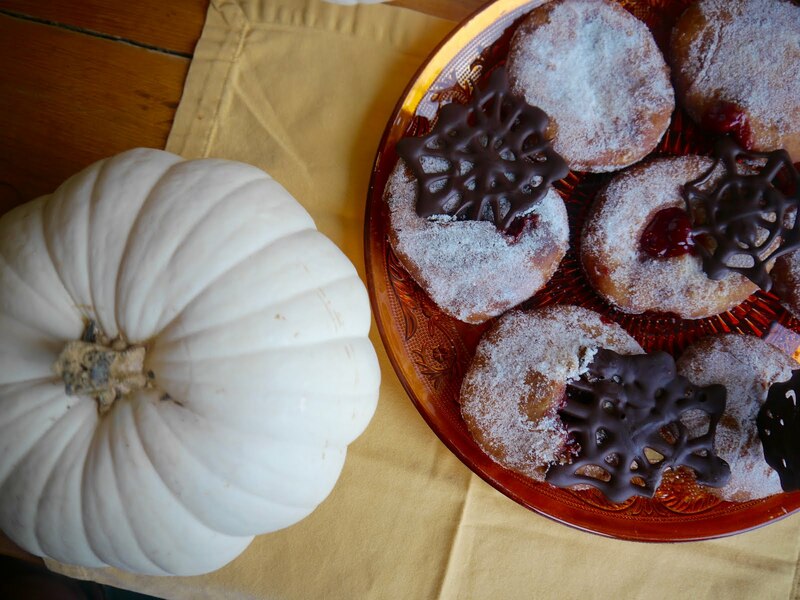 What I learned through this donut-making experience is that filling donuts with jelly is not an easy task when you have a ziplock bag and an oversized icing tip. I had managed to fill most of the donuts... only not without knocking down the mason jar containing the rest of the liquid gold, leaving a glass-shard, bloody-jelly disaster flooding the floor and splattered across the cabinets. It truly looked like a crime scene. At least I know I nailed the Halloween part. About these donuts... As we all know, I am the queen of impatience. I don't like waiting, especially when I have nothing else to do to occupy that time. So, when reading a recipe, I tend to ignore the sentences that contain words like "rise" and "rest" for "a couple of hours." I mean, when it is absolutely necessary, I can push through the pain of waiting, but when there are ways to avoid it, you definitely won't see me passing up the opportunity. 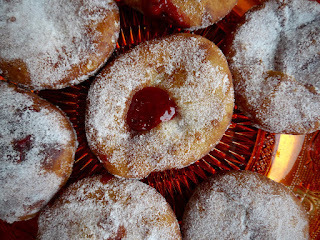 These are yeast donuts, and I did let them rise--maybe just not as much as normal yeast donuts should rise. And everything turned out A-OKAY! I personally like a more doughy donut rather than a super fluffy and dry one. These actually turned out to be what my donut dreams are made of: chewy, doughy center; flakey outer interior, and a nice soft, plush, sugary exterior. All of the other donuts were jealous. 2 cooked and peeled beets; roasted, steamed, boiled, etc. Dice the strawberries and beets into small equal sized cubes, about the size of the raspberries. Add all ingredients to a saucepan over medium-high heat. Stir occasionally, mashing the fruit down, until the mixture comes to a high simmer for about 5 minutes. Turn down to a low simmer, still stirring occasionally, and let it cook down for another 10 minutes. Blend until smooth and place back in the saucepan to thicken, over medium-low heat, for 5-10 minutes. Let cool completely and store in a mason jar in the fridge until ready to use. To make the spider webs, melt the chocolate and pour into a squeeze bottle with a thin point. On a wax paper lined baking sheet, start by making a plus sign, and then an x over it. Then connect the edges to create a spider web. Freeze to set. Take out of the freezer when ready to decorate the donuts. They will melt, but will eventually reharden on the donuts. Bring the milk to luke-warm temperature (no more than 80º F or it will kill the yeast), pour in a standing electric mixer and whisk in the yeast. Let sit until foamy, about 10-15 minutes. 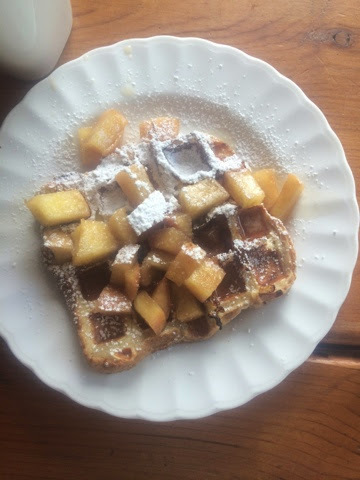 With a dough paddle attachment, beat in the eggs, cooled butter, salt, and the flavored extracts until smooth. Add in the flour 1/2 cup at a time at a slow speed until fully incorporated. On a lightly floured surface, knead the dough until smooth (no longer than needed), and place in a lightly oiled large bowl. Place a towel over the bowl to cover and set aside for 45 minutes to an hour to rise; it should double in size. Place the dough back on the floured surface and roll out until the dough is 1/2 inch thick. Use a wide-rimmed cup (about 4 inches; I used a martini glass), or a large circular cookie cutter to cut out as many donuts as possible. Re-roll out the dough and repeat until all the dough is used up. Place cut-outs on a baking sheet lined with wax paper, lightly cover with a paper towel, and let rise for another 30 minutes. Heat enough oil in a medium pot to cover the donuts (about 4-5 inches) over high heat. Test the readiness of the oil by dipping in a piece of dough to see if it sizzles. 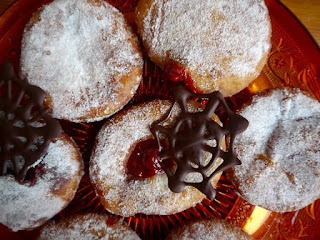 Once sizzling, turn the heat down to medium-high and carefully place the donuts in the oil. Flip each to the other side once the edges turn golden brown. The donut is ready when the center is puffed up. 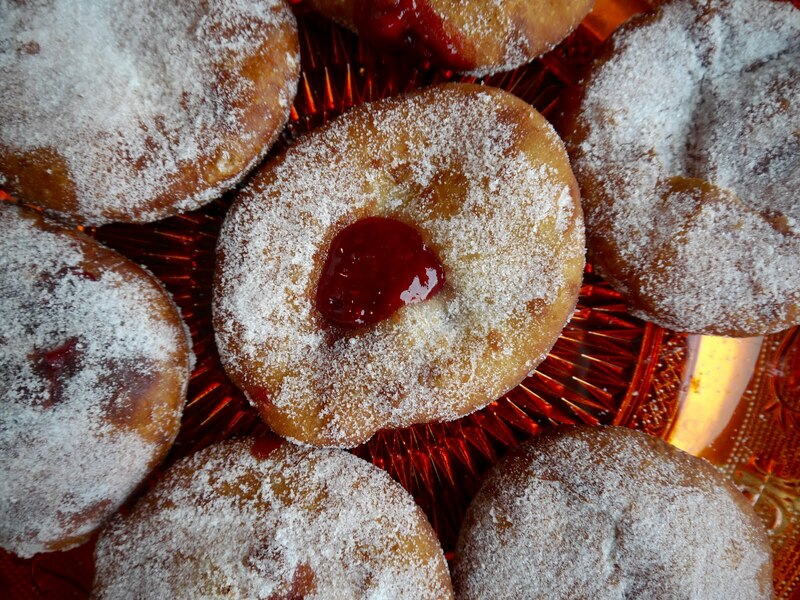 Place on a paper towel to absorb some of the grease, toss in granulated sugar, and set aside to repeat the process with the rest of the donuts. 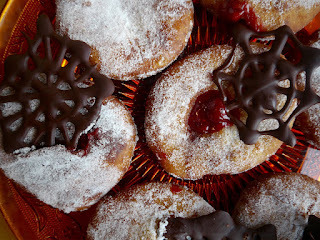 Let the donuts cool slightly and, using a pastry bag with a metal icing tip, pipe the jelly into the center of each one. 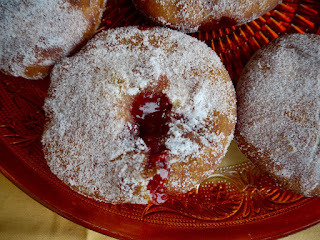 I prefer a lot of jelly in my jelly donuts, so I recommend piping until it starts to ooze out of the hole. Re-sugar the donuts, if necessary. 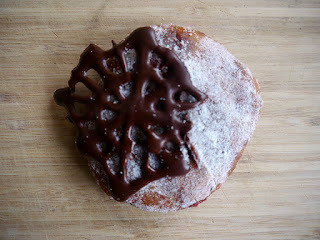 Top with a chocolate spider web and dig into your oozy, bloody, slightly scary, but really, really delicious donut. More spooky recipes to come!